The Central Truckee Meadows Remediation District (CTMRD) includes two significant geographic boundaries. The Contaminant Boundary includes those areas where PCE-contaminated groundwater currently exists, or where that contaminated groundwater is expected to migrate if it is not controlled or contained. The Service Area Boundary includes the parcels that are served by water purveyors with water supply wells located inside the Contaminant Boundary. Water purveyors with wells inside the Contaminant Boundary presently include Washoe County's water utility and the Truckee Meadows Water Authority. Both boundaries are subject to annual updates. The Service Area boundary has been updated annually since 1999; the Service Area boundary changes as parcels are added to (for example, as during development) or removed from the service areas of municipal water providers. The Contaminant Boundary was first delineated in 2001. This delineation was based on investigations to date and indicated that PCE contamination in the central Truckee Meadows extended over more than 16 square miles. Work conducted since 2001 as part of the CTMRD program led to the first Contaminant Boundary update in 2011. More than 5,000 parcels were removed from the Contaminant Boundary at that time, reducing the area inside the Contaminant Boundary to 9.5 square miles. The Contaminant Boundary changes reflect progress made in better defining the nature and extent of the PCE problem. PCE contamination in the central Truckee Meadows attributable to historical activities is not as extensive as it was in 2001. 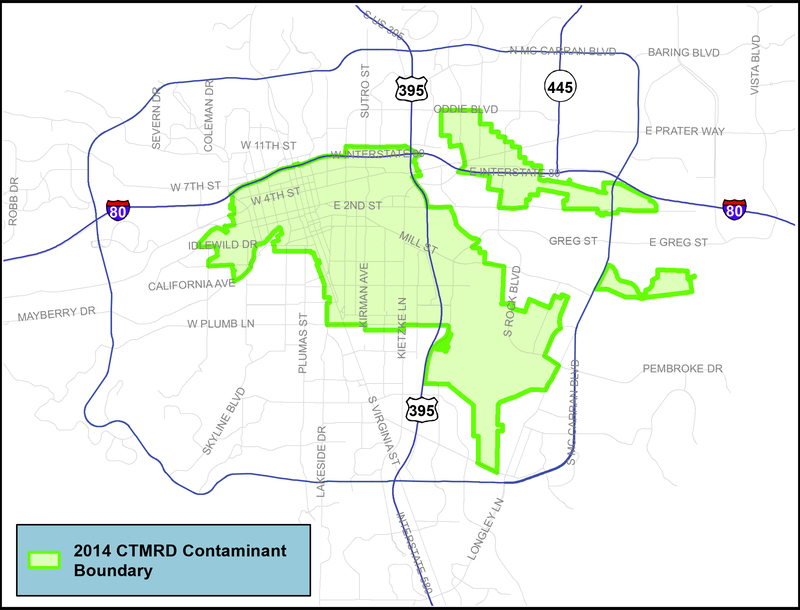 In 2014, the CTMRD Contaminant Boundary was again reduced by approximately 285 parcels (one square mile). The 2014 changes were related to removal of parcels either no longer affected by underlying PCE contamination or considered to be affected by contamination from a recognized corrective action site where a responsible party has been identified by NDEP. 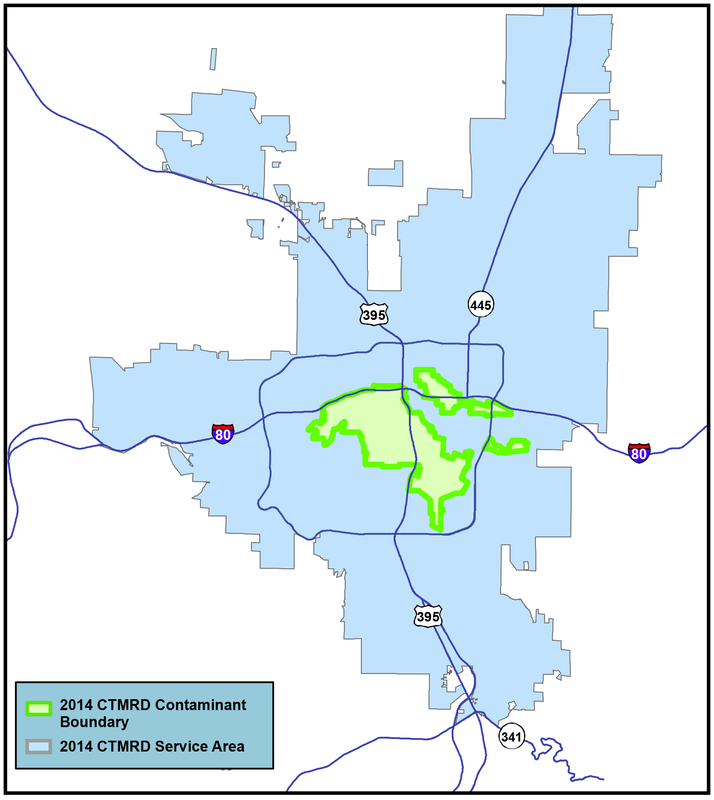 Please visit our Downloadable Maps & Reports page for current and past CTMRD boundary maps. Contact the Washoe County Clerk's Office to review the list of parcels included in the CTMRD boundaries that are filed there each year. While the CTMRD program provides benefits for all water users in Southern Washoe County served (on an either resale or wholesale basis) by purveyors with wells in the PCE-affected area and for property owners in the central Truckee Meadows where the PCE condition exists, the benefits received by each group are distinct. Benefit Group C: owners of non-residential property located inside the Contaminant Boundary. Those in Benefit Group A benefit from ongoing access to a safe and sustainable water supply. In addition to the benefit of a safe and sustainable water supply, Benefit Group B benefits from ongoing CTMRD program activities to mitigate PCE-contaminated soils and groundwater underlying their properties. This results in protection of property values by avoiding designation of the central Truckee Meadows as a federal Superfund site. Benefit Group C also benefits from limited individual liability for the PCE contamination that is provided by the creation of the CTMRD. Non-residential and residential properties are typically subject to distinct processes during transfer of ownership. Typically, lenders require that non-residential (that is, commercial) property transactions include due diligence assessments of environmental conditions. 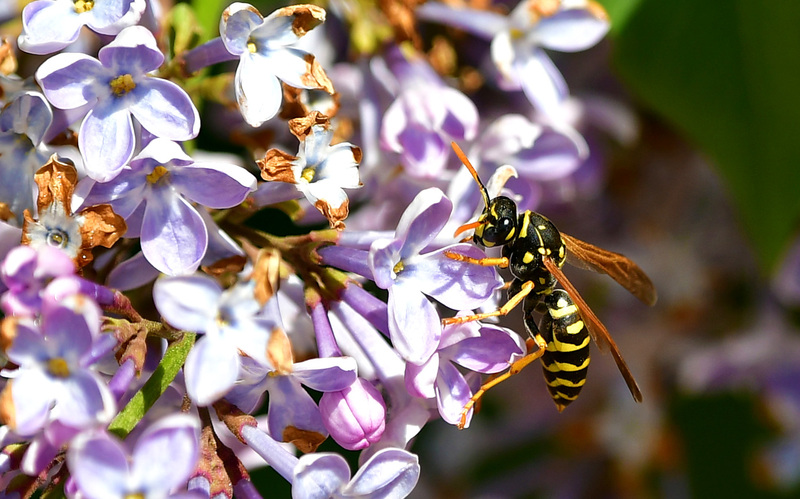 Residential property transactions typically are not subject to environmental due diligence. Nevada Revised Statutes (NRS) 540A.250-285 authorizes the Board of County Commissioners to support the cost of developing and implementing the CTMRD plan for remediation by collecting a fee. This fee is assessed annually on parcels of land located within the CTMRD boundaries. Statute requires that the fee be based on the annualized water usage on each individual parcel. Specifically, NRS 540A.265 stipulates that a tiered fee rate structure can be imposed to reflect varying levels of benefit derived from the creation and implementation of the CTMRD. Therefore, a three-tiered fee rate structure has been created to reflect the three benefit groups described above. The actual rate is determined on an annual basis. All water using properties located inside the Service Area Boundary but outside the Contaminant Boundary pay a base fee rate with a 1x multiplier. Residential parcels within the Contaminant Boundary pay a fee rate with a 2x multiplier and non-residential parcels inside the Contaminant Boundary pay a fee rate with a 4x multiplier (to reflect the progressively greater benefits received). The Remediation Fee is included on your annual general tax bill (see example below). The remediation fee for water use during the previous calendar year is included on the general tax bills sent out by the County Treasurer each July. The remediation fee assessed is identified as the line item called "Remediation." You can also find out how much your Remediation Fee is by contacting Brent Thomas, CTMRD Technology Systems Developer II, by email or at (775) 954-4633.